James Michael McLester Needs Your Support! My name is James. I celebrated Birthday # 51 on 09/04/2018 ! I am a blessed kidney recipient almost living 3 years dialysis free in Bedford, Texas. I.spent 1/4th of my adult life requiring kidney dialysis to remain alive until a kidney match was found. Though it was a long and very difficult road, I know God has blessed me in so many ways. On December 9, 2015, my living donor Laura Workman did the most selfless act one can do for another, when she donated one of her 2 healthy functioning kidneys to SAVE MY LIFE. My health IS remarkably good since the surgery. It feels Like a miracle to wake up and sense your body is becoming stronger, your system cleaned of toxins and waste, and dialysis is no longer needed. Kristen McLester accepted my proposal of marriage. After performing my concert and surrounded by our loving families, I bent on one knee and asked Kristen to be my bride. Our lives have changed dramatically since we met on September 2, 2016. We remained single for a decade on our own, facing life’s struggles without a spouse to lean on, shoulder to cry on, hand to hold and soulmate to talk to. Amidst the joy of our Newfound marriage, the reality of being responsible for enormous medical debt that has accumulated over the years for my medical care is a current challenge. Even with Medicare A,B, & D coverage, there are co-pays and deductibles, follow-up doctor visits and lab fees. It is a financial challenge too great to overcome without the continued support of others. This brings me to the purpose of this letter. To alleviate this financial burden, a fundraising campaign in the South Central Texas help Hope live kidney fund has been established in my honor. Help Hope Live, are a high-ranking nonprofit organization that has been assisting the transplant community for 30 years. All donations are tax-deductible to the full extent allowed by law, are held by Help Hope Live in the South-Central Kidney Transplant Fund, and are administered by Help Hope Live for transplant-related expenses only. If you are able and would like to help, please consider contributing. Medicare is only assisting with 80% of transplant related expenses for post kidney transplant medications and follow ups. My Medgiap plan with Manhattan Life terminated to non payment in December of 2017, when my quarterly premium from increased from $1371.00 to $1778.00. Please know your support is still crucial to my continued good health. Thank you so much for your gifts and prayers. We believe the Lord will provide an answer. Please click the yellow button “DONATE NOW” to make your tax-deductible contribution to our campaign. Your generous donation will be released to me hopefully in time to obtain a new policy. 60 Days Away and celebrating Help Hoe Live and Living Dialysis FREE since my successful Living donor kidney transplant from Laura Workman on December 9, 2019 at The Texas Transplant Institute. kid friendly portion of the event during the day 2-4 p.m. & 15 of the finest local, regional;l and touring artists across 2 stages. ROCK 4 JAMES 4 Details at the Ticket link below. Want to join me in supporting a good cause? Help Hope Live Work to SAVE LIVES. This #GivingTuesday I’m raising money for Help Hope Live and your contribution will make an impact, whether you donate $5 or $500. Every little bit helps. And on Giving Tuesday Nov 27, Facebook and PayPal will match a total of $7 Million in donations. Thank you for your support. I’ve included information about Help Hope Live below. Help Hope Live is a nonprofit that supports community-based fundraising for people with unmet medical and related expenses due to organ and cell transplants or catastrophic injuries and illnesses. We have our Winter 2018 Campaign this Saturday October 27th at RedRock Bar and Grill in North Dallas. 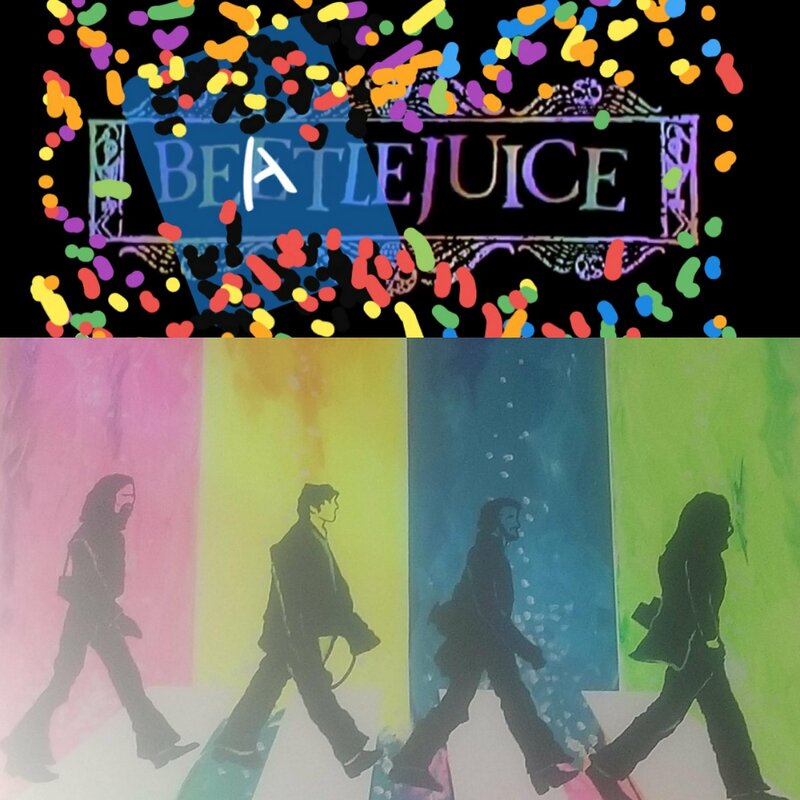 TX featuring “BEATLEJUICE” an Illustrious, Vibrant, Symphonic Tribute we assembled to the music of the Beatles. Act 2 of our performance highlights a Korean string trio of orchestral leaders and doctoral students and the esteemed University of North Texas Music school. We will perform all your Fave Fab 4 songs from the beginning of their career in 1964 to the tragic end in 1980 with John Lennon’s death. RedRock offer Free parking, Delicious food, table reservations, and adult beverages and juices, & fountain drinks. This is a 21 & up event unless a parent or guardian contact RedRock for more information. Come sing along with us for a Good cause and Remember to Help Hope Live with your generous online donations or participation in our Rock 4 James Raffle. Carmine & Vinnie Appice, Matt Starr & BCCSI founder April Samuels (triple negative breast cancer survivor and drummer at Metal Shop Dallas, TX). This item is framed. Tom Hamilton & a signed Zildjian drumstick by drummer Joey Kramer. 4)Signed Poster Carmine Appice of Rod Stewart, Vanilla Fudge, Ozzy Osbourne and appeared in a Television commercial for Synsonic drums. 4) Autographed poster by Alphonse M. John Bonham of Led Zeppelin’s drumming influence. 5) RedRock bar and Grill Gift Card $100 value. 6) Rare framed print of Paul McCartney wearing sandals with The Beatles crossing Abby Road. 7) Qty- 2 For those about to ROCK school monthly music lesson vouchers Valued at $159 each. 8) Autographed small Steve Vai ( Guitarist for frank Zappa, David Lee Roth, Whitesnake, Solo project) poster. 9) Signed Washburn guitar posters (Rare) of Michael sweet Guitarist/Vocalist of Stryper and former Bassist/Vocalist Tim Gaines of Stryper. 10) Coquette Day Spa in Dallas,, TX by professional Esthetician Lettie. Our event May 19 at Lake Arlington Golf course for our Help Hope Live 4 year Anniversary Golf tournament with dinner and an acoustic concert was a smashing success. The golfers this year played a serious game of golf and moved from green to green like Speedy Gonzales. The Dinner provided by Lake Arlington was delicious. featured my friends and fellow musicians Chad William, Shane Zehner, Marty Hill, James Jones, and Texas Links Golf Radio show Host Pat Wheeler heard Saturdays at 8 AM on KBDT 1160 AM . “I shot the sheriff written by Bob Marley as performed by Eric Clapton. Our golfers, including other golfers who were not engaged in our tournament, sang along with us under the shaded patio at Lake Arlington. This Veranda overlooks the gorgeous greens and is a sheer enjoyment.to remember! Thanks again to our campaign director Jennifer Spottiswood, Finance committee at Sonny & Frank, and Social media wiz and coordinator Agent “M” for all your efforts. Thanks to Ronnie Blea of RB2 Photography for an amazing capture of the event. FREE PLAY Arlington, Verizon Theater, Pete Persaud Entertainment for our INDY 500 pkg. Our Help Hope Live teams included Captains Pat Wheeler, Darren beck, Lugene Rogers, Nathan Bryan, Charlie Smither and John Kostas. We have an Exciting 4th anniversary Golf Tournament at Lake Arlington Golf Course SATURDAY MAY 19. Registration link is under “Events” for 18 holes of golf on this beautiful course, a catered post tournament meal and acoustic concert on the Patio all for $100 plus admin fee at help Hope Live for assisting our campaign. Not a golfer? No worries, simply register for our catered meal and acoustic concert on the veranda for $25 per person. Fyi, 1/2 of this donation is for the meal and the other 1/2 goes to our campaign. ALL PROCEEDS benefit SOUTH CENTRAL TEXAS KIDNEY FUND and are in our honor as a Qualified Kidney transplant recipient. I am currently interviewing for salaried positions with health benefits as I am self employed at this time teaching music lessons and working in auto detail. Your serious consideration to our cause is sincerely appreciated. 5 p.m EST on Thursday may 17th. Golfers who decide to play Friday or even on the morning of Saturday may 19th may pay by check or cash. Finally, businesses who want exposure on a golf hole during the tournament may register online under ‘SATURDAY MAY 19TH GOLF TOURNAMENT” select Bronze/Silver/ Gold level and Payment & art work – (logo 300 dpi vector file and in PDF file) must be received by Thursday May 17th 5 p.m. CST. Today I want to honor Chris and Laura Workman and their precious mother Dee. Thank you for standing by my side & BLESSING me with a new lease on LIFE. Hello fellow transplant recipients and campaign supporters. The financial responsibility of this is real. Here is a letter I received from my social worker at Texas transplant institute. I know There is HOPE. I was doing some internet searches and I spoke with the SW team trying to find some way you can obtain affordable insurance and / or premium assistance, and we truly did come up short. I am so sorry to report this Mr. McLester. My recommendation would be to maintain the coverage you have, to the best of your ability, and then make payment arrangements when you get bills for the 20% of MCR Part B expenses. I do hope, at the very least, you are able to take advantage of the scholarship options provided in the previous email. We always pray a foundation will open for premium assistance. We will certainly keep you informed if this should happen. Hope you have a good weekend, and you too. We are speaking with Top Golf of the Colony, TX and also The 18 Hole Golf Course “Waterchase” ( near AT & T stadium Arlington, TX) about our Help Hope Liver charity Golf outing. We are seeking inout and volunteers for a projected date of Saturday May 19th 9am cst- 2pm cst & or Sunday May 20th 2-6pm cst. Please email me at [email protected] for information. We have a goal to raise $10,000 to afford my Medicare supplement and current medical expenses through 2018. My Medicare supplement with Manhattan Life lapsed dec 1, 2017 because our campaign lacked the funding to pay the $1778 premium before our grace period ended. Thank you for your ideas and consideration. Happy Friday everyone. We are blessed beyond measure to have such a wonderful team at help Hope live working with us on our campaign. Above the $200 we’ve already raised to satisfy my kidney transplant insurance which is due January 15th or it will terminate. Simply click on the Donate Now button below to make your tax-deductible donation and help Hope live will make these resources available for me on Monday. I spent 1/4 of my adult life over 12 years on hemodialysis 3 times a week and I’m very fortunate to have received a living donor transplant from Laurel Workman at the Texas transplant Institute Kidney Clinic. You may also scroll down on this page to the ” 6 packets registration” deal, and click the “registratiom” button and choose one of the modern drummer packages or ladies fashion packages in exchange for your tax deductible donation. Please add the shipping and handling to your total and we will mail them out to you as soon as your donation is credited to our account. Thank you for your prayers, and your generous consideration and helping us with this time sensitive matter. Ahh!-larm Bling sting swag fashion packages! You receive a tax write off by helping our campaign to cover $1778 insurance premium for Jan- march 2018 Manhattan Life Insurance Company as a supplement to Medicare who pay 80% of most procedures post kidney transplant. They do NOT cover $1100 monthly anti rejection medications CellCept 500mg Mycophenolate medication regimen for the Life of the Kidney. Please donate by Monday Jan 8 2018 so Help Hope Live can issue funds to manhattan Life before our policy terminates. Happy Thursday from all of us at Campaign McLester 4543 at Help Hope Live. We are committed to raising awaeness of Organ donation & Procurement, Stem cell reseacrh (Autoglulous from patient’s on stem cells), Prevenative Wellness programs such as proper eating, hydration, exercise and prayer through our journey at Help Hope Live. Currently, as of Dec. 21, 2017 we are BLESSED to have our campaign manager Susann, PR genius Emily, & Graphic artist Addie “C”.working in harmony to raise Tax deductible donations these last 10 days of 2017. Can you see yourself making a tex deductible donation for our 10 day end of year giving campaign at campaign 4543? Public Affairs Director I On-Air . We have unique packages such as Modern drummer & Vic firth drum swag, and fashionable sunglassess with the chic “Ahh! Alarms in striking colors Gold & Black which are used as a reliable safety deterrant for females traveling alone or in the work place. Will you kindly consider donating online TODAY by simply clicking the “Register” button below our videos located on this home page and choose of one these unique gift packages for your very own tax deduction? Your generoisty will help our campaign afford Manhattan Medciare supplement insurance that is due Jan 15 2018 to cover 20 % of all medical expenses outside of Medicare’s agreement. Our Medicare supplement premium is $1800. With your help we can reach our goal to satisfy our Q1 2018 insurance supplement by Jan 15, 2108 and continue the MISSION we have to help empower other transplant recipients and dialysis patients. established 30 year non profit organization located in Radnor, PA and have eafrned the highest charity ranking score by adhering to strict IRS federal fundraising guidelines. Our campaign offers full disclosure or donations and all donations are received DIRECTLY to Help Hope Live. Theor accounting department will place your donations in our campaign fund until we successfully prove and submit the legitimacy of a medical bill or transplant related expense via a Transplant related expense report. Upon execution of this needful step, Help Hope Live pay the provider direct on our behalf. 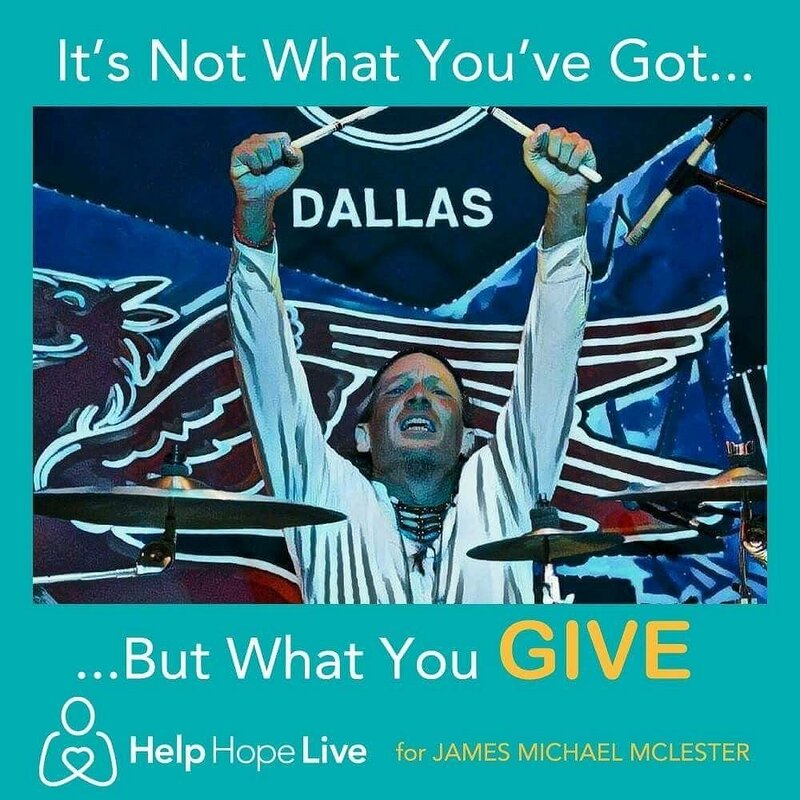 All donations are made in honor of James Michael Mclester to benrfit the South Central Texas Kidney Fund at Help Hope Live. Donations of all sizes are welcome. We believe that with your help we can raise at least $700-$1000 in the next 10 days toward the $1800 insirance premium to Manhattan Life insurance company and continue our coverage 2 years and 5 weeks post kidney transplant. Are there 12 of you called to purchase one of our 12 packages? We will announce new events for 2018 SOON and enter our third year as partners with Help Hope Live. We Have 6 special drum and fashion swag packages through Dec 31- Please register for this limited offer below and receive some really cool holiday cheer and Bonus- you can use as a write off on your taxes. We sincerely hope you had a beautiful Thanksgiving with your family. We want to wish you a beautiful holiday season and let you know that we have A 5 package deal remaining through the end of December 2017. All online donations are tax-deductible for this year and you’re serious consideration is appreciated. Thank you all for partnering with us at campaign 4543 and Help Hope Live. But when the desire comes, it is a tree of life. Webster’s Unabridged Dictionary defines hope as ‘to desire with expectation.’ The Wesleyan Dictionary of Theology says biblical hope is ‘a sure confidence that what God began to do in Christ, he will complete.’ We could look at hope as being the emotional cousin of faith. Hope sustains us. We have a very specific hope: the completed work of salvation, escape from this world and eternity in heaven. When you take time to stop and really reflect on all the goodness that God has bestowed upon you from the day he created you and you entered this world,. In spite of skewred perceptions that led us to dwell in the magnified chaos of this world, riddled witj insecurities, ripe witj self-doubt, that temporarily push us into seasons of isolation and self-reflection, isn’t it wonderful to know that our family can remind us of how meaningful life is at times when we can’t clearly see it? I’m forever grateful for my bride “Angel eyes” Kristen Jo McLester ,who has surrounded me with love and a heart that is steadfast after helping me become the best man I can be to stand for the Lord. I’m also thankful to be amidst a wonderful family. I wake up with each new day and see Life Through The Eyes of Kendall, Kallan, and Dustin, as I learn treasured life lessons. I certainly would have never experienced such Joyful Moments until I became a Part of Kristen’s adorable Family. May Grace and peace be multiplied to your family through the valleys and mountains of your life. Life is a gift- please receive it and live in the present. her wonderful assistance since we began our campaign in May 2014. I also want to thank Emily the social media guru and Jennifer in resourcing for helping me with a very time sensitive issue regarding my medicare supplement for kidney related expenses. We are discussing a forthcoming fundraiser at Chipotle in Bedford, Texas and a 4 year Help Hope Live Golf tournament in May 2018 with Pat Wheeler at Texas links Golf show. Please stay tuned for upcoming news. I am offering care packages of Modern drummer subscriptions & Cell phone clips, Vic Firth drumstick key chains, & assorted Vic Firth Tees for a limited time! 2014 at Help Hope Live. I have consulted these professional drum companies and have obtained their permission as long as these packages are sold are offered through our campaign4543 and contribute to ongoing kidney transplant related insurance premiums, follow up visits to Texas Transplant Institute, 2 anti rejection medications Prograf and Cellcept, and monthly lab work. Your serious consideration is appreciated. Here is an archive of my most recent right up online for modern drummer magazine. Thank you Billy Amendola for all of your support since our campaign began in May of 2014. Hi! My name is James. I just celebrated Birthday # 50 ! I am.a blessed kidney recipient living in Bedford, Texas. I.spent 1/4 th of my adult life requiring kidney dialysis Northeast Dialysis in Haltom City Texas to remain alive until a kidney match was found. On December 9, 2015, my living donor Laira Workman did the most selfless act one can do for another, when she donated one of her 2 healthy functioning kidneys to SAVE MY LIFE. It feels Like Awakening to a daily miracle reminder. I sense your body becoming stronger, cleaned of toxins and waste, and I have gained 28 pounds of healthy fat and muscle since I received my kidney transplant. Fortunately, Texas transplant Institute requires me to take zero steroids and I am only on too expensive anti-rejection medicines daily. Dialysis is no longer needed. I was doubly blessed on December 28th when my fiancee Kristen McLester accepted my proposal of marriage. Our lives have changed dramatically since we met on September 2016. Today?are asking for donations to be made to a nonprofit to help with the medical expenses related to my transplant. Amidst the joy, the reality of enormous medical debt has accumulated over the years for my medical care. To alleviate this financial burden, a fundraising campaign has been established in my honor with Help Hope Live, a nonprofit organization that has been assisting the transplant community for 30 years. Manhattan life insurance which is my supplement to Medicare it’s just increased its quarterly premium when I tell you 50 years old. My current premium is $1778.00 or $592.00 a month. We have two weeks to raise this amount and satisfy my quarterly premium or my kidney transplant insurance will terminate. Please know your support is still crucial to my continued good health. Thank you so much for your gifts and prayers. Natural Grocers, a rapidly growing natural food chain,have contacted me about a management position. I.will possibly receive insurance benefits benefits within 60 days of employment. This is extremely important as under the Medicare guidelines your kidney transplant insurance will expire 36 months after your date of transplant which will be December 9th of 2018. Natural Grocers scheduled a third interview phone call with their senior recruiters to determine if the position is mine. Upon completimg an.interview in.Denver,Coloradp I would travel to Denver for a month of intensive training and be apart of opening a new store in Keller of Texas 2018. I believe I have a great deal of passion and experience to share with consumers who are looking to improve their health and wellness Spirit soul and body. I was encouraged by my campaign to attach the video clip so you can see just how far I have come since 2009. Hello help Hope live supporters. I want to thank you for standing with our campaign since we begin May of 2014. I’d like to think susann reiher my campaign director for standing with me from the beginning. As I laid in bed last night .I begin to recount all the wonderful things that have happened to me even through the season of Almost 13 years on hemodialysis from age 36 to age 49. I will celebrate age 50 on September 4th, 2017. Being Tethered to the hemodialysis machine three times a week and losing your life in your middle age was not fun. 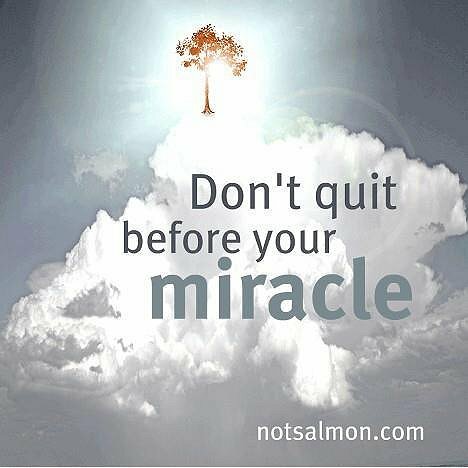 My heart cries out to many friends who still remain on dialysis and waiting on a kidney transplant. Over 26 million Americans have some form of kidney disease and many don’t realize it. Early detection and screening is Paramount to prevent progressing to stage four or in stage where your only options are kidney dialysis or a kidney transplant. I’ve had many close friends who were fellow kidney patients who died during their time on dialysis and did not survive past 5 years. Other patients have been able to thrive who are gainfully employed are married and kind of not miss a beat and received a kidney transplant soon and get back to life. Our campaign goal is to raise awareness for the others who need help that they may apply to help Hope live and see if they qualify. 30-year establish nonprofit 501 C3 Corporation. Finally. Medicare will pay 80% of your approved expenses for three years following your transplant. My coverage will expire December 9th of 2018. As I transition back into full-time sales in the nutrition or nutraceutical industry, there’s no guarantee that I will have private insurance and therefore help Hope live will be the vehicle to help me enjoy my life and meet my medical expenses. I am forever grateful that my friend of 27 years Laura Workman laid down her life to give me a second chance at life. I received my living donor kidney transplant December 9th, 2015 at the Texas transplant Institute in San Antonio Texas. In July of 2017, my new bride Kristen Mclester traveled with me to San Antonio for another exceptional follow up after 18 months post-transplant. I am able to travel, and work more in the professional music while I continue interviewing for full-time employment in the nutrition and nutraceutical sales field. This is my first marriage and it is very rewarding to have a life partner like Kristen who stands by my side unwaveringly through the beautiful Horizons ahead. We plan to partner with such restaurant chains as Chipotle, Freebirds, and additionally host of potential golf tournament and a concert in Houston to meet the needs of our immediate goal. Are quarterly insurance premium is $1,317.50 and will be due by September 30th. This would cover me until December 1st of 2017. Rest assured, your tax-deductible donations are safe as help Hope live are an IRS compliant entity with a strong Better Business Bureau ranking and a 30-year track record. All disclosures and policies and procedures can be found on this campaign page as well as flyers, and leaflets that you can hand out to others or raise awareness for organ donation. I appreciate your serious consideration in this matter. I take two anti rejection medicines for Life thankfully. The first one prograf .and the second one CellCept. are $1,100 per month through CVS. This is the cash price so without this Medicare insurance supplement it would be almost $14,000 a year just for the two medications. Above all, thank you for your prayers and please pay it forward by sharing the message of help Hope live with others you know. Your friends and family who may have a catastrophic illness and do not have private insurance or need a supplement to Medicare and a way to pay for it can be assisted by help Hope live if you qualify. You may email my campaign director suann reiher on our campaign if you have a fundraising idea or like to volunteer for one of our events. Please join us at the Guitar Sanctuary in McKinney Texas Friday September 1st for an evening of classic, Blues based rock and roll. It’s my 50th birthday weekend celebration and I’d be honored for you to Be Our Guest. Houses of the Holy DFW, celebrate the music of Led Zeppelin will begin at 8 pm. will begin at 9:30 p.m. and the event will end at 11 p.m.
All ages are welcome and they have a cash bar for adult beverages. Please come celebrate part one of my 50th birthday party weekend 2017. We are pleased to announce that our 2 year anniversary celebration at Stan’s Lakeview in the colony was a fantastic success thanks to Stan’s lakeview, our wonderful artists and Volunteers at Help Hope Live. My wife Kristen & I are planning an event in Houston fall 2017 with new artists and friends of ours in the the Southern region of Tejas. Stay tuned for forthcoming details. I want to Thank Help Hope Live and their outstanding compassionate team for their incredible support the past 3 years. I have new life because of Help Hope Live and Laura Workman my precious living kidney donor. Just in Brand New signed Guitar by Multi Platinum Touring Artists Reo Speedwagon! Now it is time for this autographed SG Model guitar signed by all Reo Speedwagon members since 1989 to “GO” to the Top bidder. All proceeds benefit our Help Hope Live Campaign established May of 2014. Thanks to Compassionate Artists’ such as Reo Speedwagon & Help Hope Lie for giving me a New Lease on Life! Stay Tuned for our 2 year Help Hope Live Celebration of Life & Music SATURDAY JUNE 3 , 2017 6-11PM CST at Stan’s Lakeview and Draft located atop a beautiful patio overlooking the lake at Sunset. Dfw all star bands scheduled including performances by Blackland Saints, Texez Mudd, Saints & Sinners, House of The Holy, & Every Body wants some . We plan to have an all star “hello Kitty” tribute featuring My living kidney donor “Wiggles” ( Laura Suarez), bassist “Goddess of Thunder” (Kim Lusk), “Injun Outlaw on Guitar (Bobby Michaelaides) & special guests. Rock Royalty Raffle & Auction hosted by Charlie Smither of Benefit Auctioneers. Delicious Food, all ages & Pet friendly environment at the Top of the Summer under the Smooth Texas Skies. With my brother in Arms Troy Luccketta of Tesla Tonight in San Antonio, Tx @The Gorgeous Aztec Theater. I am excited my future with my “Bride2 Be” Kristen Jo . We will announce our wedding Registry March 2, 2017. James & Kristen’s surprise Wedding proposal at House of Blues Dallas, TX Wednesday December 28, 2016. Tex-Mas Blues with his band Saints & Sinners. I have waited and prayed for the divine bride to cross my path after not dating over 15 years and remaining in only one relationship as I waited for the “Right One” to betroth. We all have been in this place or known someone who has struggled with the “ups and downs” of relationships. The manifestation of this aforementioned scripture along with Isaiah 58:9-12 are paramount in Our new lease on Life. These 2 key scriptures are coming to pass in mine and Kristen’s 49th year on Planet Earth. We NOW enter or Year of Jubilee together as we both will turn 50 later in 2017. What is so significant about Isaiah 58:9-12 ? This scriptures is what I prayed for 13 years. I did not urinate while on kidney dialysis thrice weekly for 13 years. I would walk or jog up to 6 miles daily, especially around the lake or near geysers and fountains, and declare this scripture. Thank you Dr. Bingman MD at Texas transplant Institute and Dr. Shen Md who performed Laura Suarez’s (my donors’) surgery. Secondly, our forthcoming Marriage Covenant is our ability to overcome medical obstacles and dysfunctional behaviors in our lives and our family trees to be “Repairers of the Breach” for Yaweh Elohim. Kristen Johnson of Forney, Texas Wednesday December 28 at House of Blues Dallas, Texas on stage. As a single gent on the “40” year plan for marriage, the Good Lord above finally sent Angel eyes to my Heart on September 2, 2016. This was my birthday weekend show at House of Blues Dallas,Texas. We serve a Magnificent Creator! He alone orchestrated our destiny September 2, 2016 and then set the stage for a surprise wedding proposal in the same Venue only 116 days later. This special night was shared by my musical project Saints & Sinners, along with notable tribute acts Texas Flood (Stevie Ray Vaughn) & Trio Grande (ZZ Top) on the main stage for Texmas Blues Christmas. Our families (on my Mother’s side, the Almonrode, Mclester. & Boaz), families were in attendance. Kristen’s family The Lindsey’s & The Medina;s of Forney, Texas attended also along with Kristen’s beautiful daughters Kallan Daniel along side her husband Dustin, and Kendall Perkins (her eldest daughter). Kristen also waited upon the Lord for 18 years for her Abba Father to send her the Gentleman who would complete her desire to Glorify the Lord in the sanctity of Marriage. We are so thankful to Help Hope Live, My living kidney donor Laura Suarez, her Mother Dee, and fiance Chris for being our saving grace. I am blessed to be monitored by the finest transplant Team – Texas Transplant Institute and continue to excel in health and follow up appointments only 1 year post living donor kidney transplant. We sincerely love and appreciate all of the media and social networks, venues and Musical artists who have donated their time and resources to bring this opportunity to pass. We are currently planning our wedding as of January 3. 2017. Our ceremony is set in STONE. Saturday April 22 at 5pm at Our current church home Crossroads Tabernacle Arlington, Texas. My Spiritual Father, Pastor Bill Bishop will officiate our ceremony. Our desire is to receive monetary blessings in lieu of wedding gifts you would normally place on a registry to resource our wedding and forthcoming medical expenses. Thankfully, I am still a beneficiary of Medicare Part A, B, & D under the medical diagnosis of ESRD, although I am healed from a living kidney transplant. Finally, I do currently have a supplement to Medicare through Manhattan Life but my monthly premium is $400 a month to cover the 20% Medicare does not pay. My surgery December 9 2015 billed at $227.000. Medicare paid the Majority of this claim. I also have hospital bills and payment plans from the 13 years I spent on hemodialysis and 7 surgeries on my left forearm for a dialysis access or revisions required. Receiving a Kidney transplant is a tremendous blessing. it allows increased work and travel opportunities to which I am capitalizing on my first year post transplant. It is indeed an ongoing financial expense for life. For the record, my relationship with Help Hope Live began in 2014. In May of 2014, we began our campaign. By December of 2015 we raised $33,000 of our $50,000 goal. As of January 2017 we have not received one single donation since December of 2015 post kidney transplant. This is simply to illustrate the need for your consideration at this time. Thank you for your careful consideration in partnering with Kristen and myself to walk out a powerful testimony and witness to New Life and a Second Chance to repair the breach. Tomorrow is #GivingTuesday, a Global Day of Giving to offset the heavy spending that comes with events like Black Friday and Cyber Monday. HelpHOPELive is Giving Back in a BIG WAY by covering the credit card fee for all donations made on Nov. 29 to the medical fundraising campaign in my honor at helphopelive.org. Less fees = more impact! Please consider a tax-deductible year-end donation to support my health. Share your support on social media using the hashtag #TealDeal and you’ll be entered to win a HelpHOPELive sweatshirt, t-shirts and other goodies! From my Rescue Angel Laura Suarez. Please read Modern Drummer Magazine’s October 2016 online blog about our story of Trial , Faith, & Triumph. Thank you for all your prayers and considerate tax deductible contributions. I want to extend my deepest thanks to all of you who have contributed to our campaign from it’s inception May 2014. Help Hope Live Makes a difference in so many beutiful lives who are burdened by enoromous ongoing medical costs not covered fully by insurance. This orgainization is an established 30 year non profit foundation and you can scroll down to legitimize their professional referrals and rankings. Help Hope Live have a dedicated, compassionate team of professionals to help you keep HOPE alive and FREE of the Burden of launching a “Do It Yourself” Go Fund Me type campaign. Finally, they have all the checks and balances you need to remain IRS compliant. I highly recommend to Help Hope Live often to others who are in NEED facing catastrophic medical costs through diagnosis. When the wind & waves are breaking around you and the Mountain stands firm in front of your forward progress-“Speak to the Mountain” in Faith Believing it Will move. Here is his last blog from 2014. A Testimony to The Goodness of Life and My Angel Rescue Laura Suarez who blessed me with a New kidney transplant December 9 2015.
at The Granada Theater in concert with Scott Stapp Band (former vocalist CREED). I am thankful to be earning a living back behind my drumkit with Supernova Remnant, Saints & Sinners, Houses of the Holy, and teaching lessons. Thanks to my family, congregation, friends and fellow musicians who helped us raise over $36,000 the past 2 years to make this possible. The Surgery alone billed at $227,000 and Medicare takes care of 80% under a diagnosis of end stage renal disease..
Further, many recipients have ongoing medical costs such as anti rejection meds ( required), travel to transplant follow up appointments, & Medicare Insurance supplements at $400-$700 monthly. Currently, over 26 millions are diagnosed with one stage of kidney disease. Your generous gifts to Help Hope Live are sincerely appreciated and Tax deductible. Help Hope live are a long established Non Profit Corporation with over 30 years experience. MXD Rock and Metal Awards. through Oct 31 so this is a 6 week campaign. My music career is taking flight again. Please support my new lease on LIFE by voting on the links below or copy and paste in your browser. ******* Vote once and share daily with new friends with respect . No SPAM please. semi finals to select top 10 in each category through August 31- finalists advance. SOMEONE SPECIAL SAVED MY LIFE! read all about it here! We need your support transitioning for 13 years of hemodialysis and 80% less income! All contributions are tax deductible through Help Hope Live and established 30 year Non profit to help those with catastrophic medical expenses. I am teaching music and and performing live weekly as my source of income. I also have an autobiography available. ” I am doing exceptional per the transplant team in San Antonio, Texas. Thank you all for your prayers & generous giving these past 24 months in helping raise $33,543 toward our goal. I am transitioning back to work full time and FREE of hemodialysis thrice weekly. I am already on track to double my current income by June 2015. However, I do have a $400 monthly Medicare supplement through Manhattan Life and a minimum of $200 in additional medical expenses (medication, supplements). Will you help us maintain our monthly goal of raising at least $700 the next 12 calendar months to cover these new found expenses? I will increase my income from music instruction, live performance, book signings, and Wellness promotion, but need help during this transition. Please learn more about our story and Paying it Forward in the video below produced by DRUM TALK TV with a Global reach of 20 Million viewers. Our family is celebrating one of the most rewarding Christmases ever thanks to my dear friend Laura Suarez. After 13 years on hemodialysis three times weekly in end stage kidney failure, I received a living donor kidney transplant from Laura Wednesday December 9th at the Texas Transplant Institute in San Antonio, Texas. It is been such a liberation to receive all of your prayers well wishes and financial contributions that help our campaign continue through the transition. I have not had hemodialysis since Tuesday December 8th for 17 days now and it’s been a beautiful new lease on life one day at a time walking with my Savior ,my healer ,and my deliverer Jesus Christ. Thank you for your continued support please stay tuned for many upcoming events and announcements in 2016 around my music and my new autobiography “Wannabee-Rock-Star-Who-Finally-Found-The-Rock “. God’s Richest Blessings of Peace & Prosperity multiplied to you. Saturday December 12- I slept fairly well last evening and awoke to another chest x ray. My chest (left side) has a small tube installed to drain fluid and seal a small puncture that occurred running an IV.line Into my left lung during the procedure. It feels much better today. RN said my kidney function labs & clearance are excellent this A.M.
Meanwhile,Laura,my living donor is resting nicely back at the Hotel with her wonderful Mom. My Mother Susan,will come back to Methodist Transplant Specialty Hospital to visit me after 9 A.M. It also appears a few very close friends from Dallas-Robbie,Debbie,& TNT made a road trip to visit me. I am on Solid Food Today and Expect Great Things Ahead of Me. Your continued, steadfast prayers and support have been remarkable and full of Love & Light. Special Thanks to Pastor Corey Jones and our Crossroads Tabernacle Congregation for standing with me the past 13 years. Hallelujah & Praise Be to The Father of Lights whom there is no variableness of turning! This is Day #2 post transplant and we are making improvements in mobility and urination because of your steadfast prayers. I am deeply touched & sincerely blessed to have My beautiful Mother Susan by my side along with my living donor Laura Suarez and her precious Mother Dee. I expect Wonderful days ahead in our NEW SEASON. Please continue in steadfast prayers,worship,& fellowship as we look to the LORD for guidance to our collection destinies. Today December 10 is Day #1 Post living kidney transplant From my dear friend Laura Suarez. I am recovering well & urinating. Please continue in your loving prayers. PLEASE SHARE AS OF DECEMBER 7.
my living kidney donor transplant is scheduled Wednesday December 9 IN [email protected] Transplant Institute with Dr.Adam Bingaman MD. Surgical Team informed us the procedure should be Approximately 3-3 1/2 hours. I am eternally thankful to God,my friends,family ,& in particular my “Rescuer” & Donor Laura Suarez. TODAY IS December 7s a SPECIAL DAY OF GIVING. We Appreciate your tax deductible donations toward our campaign to Defray medical expenses. my living kidney donor transplant is scheduled Wednesday December [email protected] Transplant Institute with Dr.Adam Bingaman MD. Tuesday December 1 is a SPECIAL DAY OF GIVING. By April & Calvin Mims. Your continued prayers and donations are greatly appreciated to defray medical expenses related to surgery, anti rejection medications, and living expenses while in recovery 6-12 weeks. Your tax deductible donations can be made here via- credit card, or you may mail a check- see instructions below (bottom left corner)on this page. Special Thanks to the ENTIRE Team @Help Hope Live Especially “Coordinator Emily” for an Extraordinary Job handling Press Releases & Follow ups for our recent Fundraiser at Hard Rock Cafe , Dallas Texas. Also Very Special Thanks To Hard Rock Cafe GM.Bryan Dobbins and his team including Eric, Carolyn,& Amanda. Additionally, Special Thanks to Kelly McCroy w/MCA.Public Relations & Ticket Web. A Divine Encounter Took Place July 2014 that changed the course of my Life & my fundraising campaign thanks to the Absolute Passion and Action of Tesla Drummer.Troy Luckketta. Troy I love you brother and Am eternally thankful for your efforts toward our campaign at Help Hope Live ROCK4JAMES. The Heart & Soul of our Help Hope Live ROCK4JAMES.Team who unselfishly give of their time & creative gifts. “Wild” Jim Long-Worldwide Broadcast ANCTV. We Also appreciate the following Media Outlet who covered ROCK4JAMES PT.2″The Beat Goes On”. Martie.W-Healthy By Nature WORD 100.7 FM. Bo & Jim Lone Star 92.5FM. Super Special Thanks to the Artists who brought their “A++” Game regarding the talent & performance. Burning Sky Band- Glenn & Kristy Johnsin, Brian F., Christopher,& Tommy Rocked the house with songs ranging from Journey to Foo.Fighters.We Love you and you are a special band. Texez.Mudd-My brothers TK.Harris, Andy Chang, Josh Littke,& Kerry Collins sharing their original Texez.Blues/Southern Rock Sound mixed up with Classic tunes from Stevie Ray Vaughn to ZZ.Top to Creedence. Clearwater Revival. I appreciate you pouring your heart & soul into your performance. Saints & Sinners-Trubute to the Music of Whitesnake. I am very thankful to David Roberts (Captain of the Sailing Ship), for partnering with me to REALIZE a vision of reaching Lost, wayward souls through Kingdom Believing & Music. A special heart felt thanks for Scott &”Pops” Shoemaker for The Birthday Celebration & willingness to STAND against Cancer & Kidney Disease. Our event successfully raised funds & awareness toward our campaign goal.of $50,000. Thank you All from the depths of my heart for your contribution to this Event. In closing, Hard Rock Cafe GM.Bryan Dobbins sent me an email within 24 hours of the finale of our Event to Say it was One of the MOST SUCCESSFUL events Hard Rock Cafe Dallas, Texas had Hosted. Cheers & We Will see on on my Book Tour for the Brand New 442pps.edition of “Wannabee Rock star who Finally Found The ROCK”. Thanks to YOU our [email protected] Hope Live is A continued success.in.progress & we just Received a Grant from Help Hope Live toward The South Central Kidney Transplant Fund. “The “Timing” of a Thing” was spoken to my Spirit about This Current Season and I AM Patiently Expecting My Lord to Bring The Full Restoration/Miracle to Pass. for a 7 minute Video produced by Neil B. Video player atop the page. Artists featured @ Help Hope Live 4 James. Volunteer Appreciation Night is tonight! Check out details and the flyer under Fundraising Activities on this page. ROCK MEMORABILIA RAFFLE ENDS TODAY @ 3:30 PM CST! Don’t miss out! View James’ Photo Albums below to scope out the awesome items up for grabs! you can Donate from anywhere in the World 24/7. To view some of what is available, go to Fundraising Activities below and click Rock memorabilia or click Register to purchase your tickets! Hi, This is Buddy Magazine Texas Drum Tornado James Michael McLester and I want to tell you about something causing me to fight for my life that you or a loved one may be afflicted by without you even knowing it … yet. After 12 years on hemodialysis three times weekly, I am asking you to partner with me in raising funds toward our kidney transplant campaign and in turn helping others while raising awareness to how I and many others are afflicted with this disease potentially from mercury in dental fillings that can be linked to kidney damage. Our campaign at HELP HOPE LIVE would Love your Support. We are raising money for my kidney transplant campaign at Help Hope Live and hosting an ALL AGES benefit concert at the infamous “Gas Monkey Live” In Dallas, Texas Thursday June 4. And if you can’t attend the event, you CAN help online from anywhere in the world by going to the link in this post. This is to help save my life and raise awareness of Kidney disease that could help save the life of someone you love – or yours! You can HELP us TODAY by making your BEST Tax deductible donation or “Gift in Kind” to the Help Hope Live link in this post. You may also purchase tickets to June 4th and VIP & Raffle for a chance to win some cool Rock and Roll Memorabilia by visiting the raffle link. By Attending JUNE 4 to raise awareness and donations, You will Make a HUGE difference in my LIFE and the Lives of others. You will be entertained by some of Texas’ finest artists in a premier concert venue with state of the art production and sound. VIP will receive special seating and early admission for wine tasting, art auction, rock memorabilia auction, exclusive book signing, and more. You will leave wearing a SMILE in your heart knowing you made an Impact while having the time of your LIFE! Author “Wannabee Rockstar who finally found The ROCK”. Here’s an appeal for our upcoming June 4 event at The Gas Monkey! Spread the word! James Michael McLester is an author and professional rock musician who needs your help! It all starts on Thursday, June 4 when Troy Luccketta, the drummer for legacy 80s rock band Tesla, lights up The Gas Monkey in Dallas along with a few special friends. The event will include all-star musical performances, an auction and a wine-tasting event, with all proceeds benefitting James’s transplant expenses. James will be on the scene to sign new copies of his inspirational autobiography. James is a devoted rock musician and Buddy Magazine Texas Drum Tornado. He was diagnosed with end-stage renal disease in his early thirties. He’s on the waiting list for a lifesaving kidney transplant, but he needs help to cover medical appointments, expensive transplant medications and other pre-transplant necessities. Will you help James get the lifesaving kidney transplant he needs to keep rocking? 1. Donate your gear! If you’re a celebrity, athlete, or musician with signed memorabilia or instruments, donate them to the June 4 fundraiser. Better yet, join us and sign your gear in person. Bring friends and fans! 2. Give James a boost! All funds are collected through nonprofit HelpHOPELive to help James with his expenses. Check out James’s fundraising page online. 3. Come to the star-studded event! Join Troy and friends on June 4 at The Gas Monkey and rock out for a great cause. Special thanks to Peter Ore at The Gas Monkey for his generosity in supporting James’s fight to rock on. THANK YOU” to Gobi.Nathan of Singapore who purchased our 50th anniversary guitar signed by all members of the German rock band The Scorpions. Gobi,is a big music fan and a collector who works in insurance sales and travels the globe. Thanks to everyone at help hope live who helped us with the registration process and promoting this event via social media. If you’re a fan of rock music memorabilia we are planning to have more items for auction at our wine tasting /art auction and concert slated for June 5th or 6th in Dallas Texas at one of the most premier venues Gas monkey live. Troy Lucketta, the drummer of TESLA iIs planning to be a part of the concert wAll star surprises!!! Please mark down June 5th and 6th on your calendar for this great event to raise money for our campaign and help hope live. We plan to offer VIP.pkg. I encourage you All to pick up my entire Autobiography “Wannabee Rock star who finally found the ROCK”. Simply click “Donate” button upper right corner and follow PayPal instructions. Black & White Vintage version $23.99 includes shipping & handling in most USA STATES. Thank you for your prayers and continued support for our campaign. We just came from our interview with Drum Talk [email protected]@NAMM show 2015 in California. Stay Tuned for New concert announcements and fundraising events. Chick-fil -A. HURST TEXAS PIPELINE RD. Please Tell your cashier when placing your order that you are purchasing meals for the “Help Hope Live Fundraiser for James”. Today is the last day to make your Best online contribution and receive a Tax savings for 2024. Please log on to our campaign and make a difference. Have a Blessed and Safe New Years’ Eve ringing in 2015!!! Here is the podcast from our radio interview w/Dr.Renee Sunday yesterday. We are Excited that copies of my new book “Wannabee Rock Star who finally found the ROCK” are being sent around the USA & Foreign Countries. We are Seeing New Donations arrive Daily and Thank you for your Generosity. Also, a Huge Texas Sized Thank You to All of you who helped make our event @Chick-fil-A a Exceptional Success. Please consider logging on Now and making your BEST tax deductible donation to our campaign at Help Hope Live before December 31st. We have raised 25% of our goal for Phase 1 and we appreciate your donations..
My dear friend is being tested This Tuesday to see if he is a good match for a living donor. stem cell treatment September 28 in Atlanta Georgia with Dr Monte Slater DO.Aesthetic Body Sculpting Clinic. I can work an incredible deal for those who are wanting to receive an autologous stem. Cell treatment to improve any chronic health condition you may have researched. the clinic and compassion of the medical team. I enjoyed being able to have my procedure on an outpatient basis in the USA Rather than traveling abroad. Please Read this Update and share with others as you go online to Donate to our campaign. Some very exciting things are happen in my Life since my own natural stem cell transplant in Atlanta GA at Analytical Stem Cell Institute. Ever since God granted me a “New Beginning” after living through a near death experience from a kidney failure episode caused by Mercury from dental fillings and 8 days in Presbyterian Hospital, God is making all things new through his resurrection power. Living for my dream of a Family on purpose while serving God and others in business and the arts is one of the greatest reasons I have yielded to the Lord’s plan for my Life. Your donations are very helpful and help me realize a new future after spending $120,000 out of pocket for medical expenses and programs to regain my health and resurrected kidney function. My love Tammy who has been so dear to my heart and I cherish her and look forward to our New Life together. My Aunt Pam and Uncle Carl for their donations and prayers, My Aunt Shirley and Uncle Bob for their support and encouragement. all the supporters of SuperNova Remnant & My Book network “Wannabee Rock star who finally found the ROCK”, Youngevity and Dr. Wallach, Dr. Pompa, Warren Phillips, Rebbecca, Tom, and Adriana, Bobbi & Susan and our Vitality family, Dr. Robert Bard and Humus4all, Morris,Tom & Pam Wood, Sue, Greek Isles restaurant and Plano Rotary Club, Warren and the Rail, Captain Carruth, Big Eric, Mitchell, Bishop, Clint Barlow and Trees, and KDKT radio Jason “Tiptonizer”. Mad Maxx Hammer, Dangerous Dave, Eric Dj Metal God, David Ray Global Rock show, Nancy Johnson KTXQ Q102, KVCE 1160 Radio Rockin’ Robin Valetutto, Pat Wheeler Texas Links, Pete Persaud Bridge to Care, Terri Knight Radio Queen the Bear, Toni Rock UK, Robert Rosas . Tammy KC, Michelle K @ The Pulse, DJ Wild Walt @ 365 Radio Network, Beejay Major, Niacom and Michael Anthony Johnson, Milton Wallace All Nations TV,Prayze Factor Awards, Josh Migz & Epic Texan @ Thirteen Steps Radio, Warehouse Live Houston, sBlues Houston, Dallas, Ridglea Theater, The Door, Curtain Club, Aulora and Orileys,Dj Drue Mitchell, Eddie Alcaraz and Dawn @ Power FM 89.7 , Craig Stracener and Family. Mark and Chucky Stevenson, Carrie Perganits, Don and Nancy Cole, Kevin and Beth Smith, Shane McCauley, Mike G, Mike Stern Edge Realty, DFW Drummers Network, Chris Manning, Kristin , Luis, Rhonda, Beth Ann, John White Golf for Goodness sakes, Mark @ waterchase, Dave & Michelle Hineman, Lee and Cyndi Cobb, Sergio and Janisse , Eddie and Lisa, Dr. Max and crew, Dr. Torres and crew, Dr. Cannaughton and crew,Dr. Weingarden and Heartplace, Radio Martie and Andy, Darlene on WORD FM 100.7, Dr. Hafeez and crew, Crossroads Church Family, New Beginnings Church, The Hills and BROW, Confirmed, Crimson Storm, Blackout,Sean Booth, Lynnette, Lynnrae, Katie, Regina, Raine, Eldon Hamer, Leighton, Rico, Mike Pisterzi,Maximedia,Russell,Bobby G, Jesse, Bernie G, Brian Big Bass, NAMM, TAMA Drums Emery Fry, Zildjian cymbals, DW Hardware,SKB Cases, LP percussion, Vic Firth sticks, CD Baby..
SuperNova Remnant fans too many to mention all over the world…..I know I snot name every single donor so please forgive me. I typed everything that came to mind. A special thanks to Madeline, Fran, Susann, Renee, Stephanie, Claudia, Amy and all at Help Hope Live. You are the best and here’s to an Abundance Future together and helping others be FULLY RESTORED. The staff were so kind and the customers were a blessing to me in so many ways from familiar faces to new friends and especially the little children so full of JOY, WONDER, and LIFE! Extra Special Thanks to Kristin Iovinelli for suggesting we host our fundraiser. I plan to include the commentary in my 2015 Book forthcoming. I have read it three times and I learn something new every time I read it. It’s inspirational!!!!! I hope that every Rock and roller gets a chance to read it. I wanted to get a personal copy of the book from James after listening to Supernova Remnant’s music. You have heard the phrase “A picture paints a thousand words” Well, James did not hold back on pics in his fascinating book. Turn the pages and watch this motivating story unfold before your very eyes even before you read a single word. And trust me; it even gets better after that! Take it from this Rock and roller boy and read the incredible story that James has to offer. This is a must for anyone who collects Rock memorabilia! Thanks James for telling your story. It’s enthralling!!! And keep those shades handy because the future is bright! We wanted to take a moment to thank all of you from around the country for your generous donations to our campaign at Help Hope Live. My recent blood work is very encouraging in a few areas, specifically my blood counts and hemoglobin level. This is portent as hemodialysis,can remove blood cells during treatment and yield to anemia. Thanks to my family, our volunteers, donors, social media promoters and to our team @Help Hope Live, Susann.Reiher, Claudia, Stephanie, Joni, Renee’., Fran, Madeline, & Amy we have almost raised $10,000 toward our Phase 1 goal of $50,000. Special Thanks to “Steve Sledge Barton” for his steadfast effort in raising awareness. In just the past two months , we’ve had two successful campaigns with major Chick fil A locations-Arlington, TX special thanks to owner Carmenza. & RMD.Beth Ann Jones. & The Colony, Tx owner Warren and RMD. Rhonda Graham. Our 1st annual charity Golf tournament was a Huge Success thanks to the diligent efforts at Help Hope Live & Golf for Goodness sakes- John White & Pat Wheeler, and Rocking Robin from KVCE.1160 AM. All of our Golf Captains Don Cole, David Mathias. , Kevin Smith, Carrie Pergantis, Mark Stevenson, Dr.Nathan Bryan phd., Tom Wood . Mark Aston and crew @Waterchase Golf Club. Tammy & her team @Office Depot. Hole sponsors Michael Stern @Edge Co. REALTY, Neogenis.& Susan Shaffer/Dr. Nathan Bryan Phd., Cotton Patch & Marty Bryan,& Ovilla.church of the Nazarene.Pastor Ron Adams. Thanks to my Musical guest Dave [email protected] Hineman Music, available as a performer, arranger, teacher. These events have built fellowship & brought Glory to God through Unity. I am excited to announce our next 4 events where you can connect with me & Help Hope Live. THURSDAY OCTOBER 23-SATURDAY OCTOBER 26. Supernova Remnant merchandise and my Book “Wannabee Rock star who Finally found the ROCK” along with my signature drumsticks will be offered. YELLOW ROSE OF TEXAS MEMORIAL MATCH. Featuring the Famous Von Erich.wrestling family & musical guests Supernova Remnant. Chick – fil A 5211 El Dorado Pkwy. Come enjoy a delicious Chick fil-A. Meal dine in or drive thru , mention our event when placing your order,& Chick – fil-A.will generously donate 20% of the proceeds to our campaign @ Help Hope Live. *** Note: You MUST mention our event when ordering for Chick – fil-A.to donate a portion. My Book “Wannabee Rock star who Finally found the ROCK” along with my signature drumsticks will be offered. 4. Supernova Remnant live in concert with Guitarist Jake E.Lee @Trees Deep Ellum, Tx. We have presage tickets $18.50 each. Please email, tweet, Facebook and share these events. This was a very meaningful and memorable day for me. The Lord opened up the Heavens and created one of 2014’s nicest days on the heels of Yom Kippur. So many amazing people [email protected] Hope Live Susann, Joni, Fran, Stephanie,Madeline,Amy, Claudia assisted us from the professional headquarters in Pennsylvania. Steve Sledge Barton shared our posts on social media steadfastly and also approached area business for corporate sponsorships. John White and Pat Wheeler of “Golf for Goodness sakes” administered the tournament and came on board after hearing my story from Robin Valetutto “Sports Angel” KVCE AM 1160 – DFW’s Business Authority. Cotton Patch Cafe , EDGE Realty Partners, Ovilla Road Church of The Nazarene, Neogenis Labs all participated as Hole sponsors. Debra Norris Richmond , Carrie Taylor Pergantis Susan Howeth were all on hand to register golfers. The captains we selected to raise money and send out letters, emails, and phone calls re: our cause were exceptional. Mark StevensonDon Cole,Lugene Rogers @ Tom Wood Nathan Bryan Ron [email protected] Kevin Smith, David Mathias. Bobby Minor a Pastor/golfer also shared. ‘Lisa Dent Lisa Renee Andrews Michele Zeh Bedgood Robbie Gustin Heather BlueeMichelle Masters AndersonKathleen Mayfield Kristin Kristin and several others reached out. I apologize If I did not mention your name- I am on recall after an incredibly blessed day meeting dozens of people. Special thanks to Mark Aston Waterchase Golf Club for the professionalism and working with us. Marty Bryan VP of Operations for Cotton Patch who served a delicious ,healthy meal before our post golf tournament concert. Many of the golfers/attendees won great prizes including gift cards from Carrabba’s Italian Grill- Hurst Chick-fil-A at North [email protected] Cotton Patch,@Neogenis, 2015 passes to The Colonial, and rounds of to DFW area golf courses. Very special thanks to Dave Hineman Music for accompanying me on acoustic guitar jam- Dave is an “in demand ” guitarist/performer and freed up his Saturday evening to come with his wife Michelle and Tess his daughter. It was very special my Mom @ Susan Howeth was there- she has been there for me since the “Born again” experience I had in 2003 that is in my new book Wannabee Rock Star Who Finally Found The Rock edited by Gary Taylor and made possible by Robert Bard. Thank you ALL for your prayers and generous donations to make this procedure possible. I ventured to ABS CLINIC Today I. ATLANTA, GA. I was very impressed with the cleanliness and vibe of the clinic. Dr.Slater’s wife Gail is very compassionate about her children, music, & helping others. They even showed me their own music video which was well done. Dr.Monte Slater Md used my autologous stem cells known as MSC’S (Mesenchymal Stomal Cells) and re injected them via i.v.after they were centrifuged. What happens next is in the LORD ‘ S Hands. The research that is dawning in the US is promising firm on the platform of research being conducted around the globe. I am honored to announce that Troy Luccketta of Tesla donated this autographed guitar to help with my fundraising efforts. It is an Epiphone Special 6-string electric guitar signed by the members of The Scorpions to commemorate their upcoming 50th Anniversary Tour. It comes with a certificate of authenticity. our “Wannabee Rockstar Charity Golf Tournament” Saturday October 4th @ Waterchase Club in Ft. Worth Texas. Prizes including a round for 4 @ a prestigious Dallas Golf Club, 2 passes to The Colonial in Ft. Worth, Music, Wannabee Rockstar Full color autographed book,Restaurant Gift Cards and much more. Post golf tournament meal/beverage/dessert catered by Cotton Patch Cafe. Mini acoustic Concert featuring Dave Hineman a fellow Texas Tornado & DFW accomplished session guitarist and live performer with such bands as Solinger, Dream ON, Peter Frampton Tribute, & Greater Southwest Guitar show annually. Book signing will also follow. Funds are needed for my trip this Saturday to Atlanta GA for my stem cell procedure using my own stem cells. Special Thanks again to everyone for your prayers and shares. Extra Special Thanks to Chick-fil-A The Colony Marketing Director Rhonda Graham and Owner Warren Leonhardi and his excellent staff for their service and professionalism. And a Super Duper Special Thanks to Chris Manning and his wife Carol, Son Evan and friend Cameron for graciously hosting me. “Wannabee Rockstar who finally found the ROCK”. Good News- we’re raising money to help me receive my own stem cell procedure in 19 days. I’ve been on kidney dialysis 11 years after mercury from silver dental amalgam fillings affected my kidney function . Saturday October 4th 1:30PM start @ The beautiful “Waterchase Golf Club” Ft. Worth, TX. A mini acoustic concert, awards banquet, and book signing will follow our golf tournament. Would you be interested in more information to help us promote it? I spoke to Dr. Slater’s wife Gail today in Atlanta GA and we discussed postponing the stem cell procedure scheduled for Sept. 6 because we still need to raise $2500 and the airfare will be more economical with a 14 day notice. Thank you to all who have generously given of their time and donations thus far. One of the songs that has brought me through my journey. No they’re not gonna hold me down. I’ve got Faith, Faith of the Heart. I might even sing this song at our Charity Golf tournament wrap up party Saturday October 4th @ Waterchase Golf Course in Texas. I Spoke to Dr Slater Md. of a stem cell procedure in Atlanta Georgia SAT.Aug.23. As of today, Saturday August 2nd ,we need to raise $5000 in the next 20 days. This is a link to a July 24, 2014 Healthy by Nature Show newsletter hosted by Martie Whittekin, CNN. To read her plea about James’ most recent medical news and how to help, click the link and scroll down to “Please help me help save my friend’s life”. Feel free to forward it on to your facebook and twitter friends who might be interested in a story of survival from trial to triumph. Click the link below listed under “Fundraising Activities” to buy your chances to win this valuable collectors item signed by various artists including Stewart Copeland, Mike Portnoy and Troy Luccketta. Dan Shinder the multi-talented great one is producing a high quality ,high impact video explicitly used to raise money for our stem cell/ possible kidney transplant. Very valuable Autographed Drum Head Raffle starts today!!! This is a June 7, 2014 podcast with James as the featured guest on Inside the Game hosted by DFW Sports Angel-Robin Valetutto. 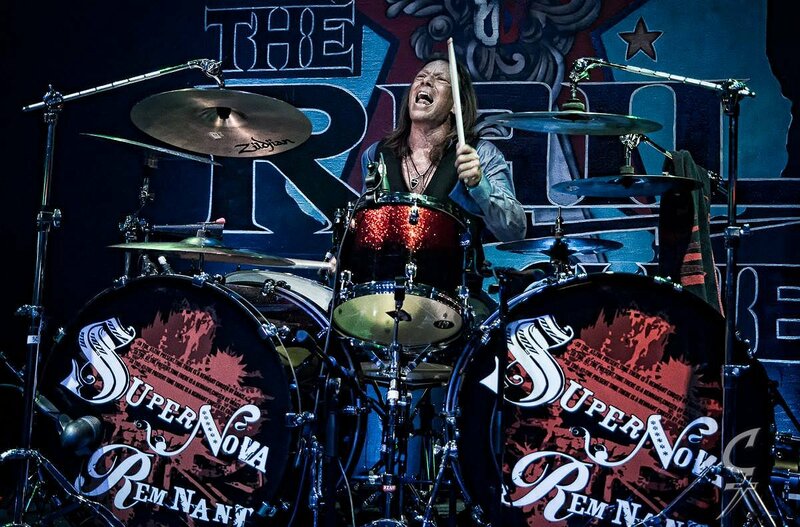 As an acclaimed drummer & song writer for the Heavy Christian Rock band Supernova Remnant, James is “playing” for his life. Hear him speak about his newly released book “Wannabee Rock Star Who Finally Found the Rock“…a tell-all story of how a spiritually bankrupt musician finds love and redemption after many years of running in the shadows of the Dallas-Fort Worth hard rock music scene beginning in the early 80s and continuing into the new millennium. Proceeds from the sale of the book will be used to help James’ uninsured transplant-related expenses. @a Hope you ALL had a Blessed Memorial Day weekend remembering the men and women who are so bravely serving our country. A VERY special thanks to all the wonderful SUPERNOVA REMNANT CREW, FANS, and music business professionals that made our recent show with Skid Row a success at Trees night club in Dallas Texas. I appreciate it all of you who came by and picked up materials To purchase MY NEW book “WANNABEE ROCK STAR WHO FINALLY FOUND THE ROCK”. Please look for your local news media in Dallas Fort Worth for coverage on our upcoming concert with VH1 star Kip Winger and his [email protected] Dallas, TX Thursday June 5..All ages. Tickets $21 through Supernova Remnant. Please take a look at my new website built by HelpHOPELive. SuperNova Remnant is preparing for the release of our new CD, Rockets Red Glare, which will LAUNCH at our show with Skid Row next Saturday night, May 24th at Trees in Deep Ellum, Texas. Plan to arrive at 7pm to hear Supernova Remnant perform from 8pm to 8:30pm. mega platinum world touring group Skid Row! *Look for my table. I’ll be there to autograph copies of my book, “Wannabee Rock Star Who Finally Found the Rock”. A big thanks to all who came out Friday to hear my testimonial and to purchase my book, “Wannabee Rock Star Who Finally Found the Rock”. A percentage of the sales will go to help defray my transplant-related expenses. Donation by RTC Sound We support this great cause! James God is good! His mercy and goodness is forever ! I am so grateful to Him for your life and Laura. We support in prayer and donation believing everything is for His grace and Favor upon you. God Bless you both Jami and Laura! God bless you James. Sending you prayers from Pittsburgh Pa.
Hi James. This is Jules. Feel better soon. My mom and i love you. James, your an inspiration to all of us, and a fighter to survive! You have been blessed with gift of music and share this gift with so many! Your book is amazing and so are YOU .. god bless. James I've told you before,you are my hero and live my dream.Rock on brother.Your faith in our God is pure. James I just want you to know ......... your an amazing person and I consider myself blessed that your part of my life. Your book Wannabee Rock Star Who Finally Found the Rock is just an amazing journey of strength and encouragement. YOU ROCK! Just wanted to let you know James....that you are very special. You have been there for the best positive advice a friend could give. Also told me about "Vitality" which has been a God send! Let's get all the folks together and support you on your kidney transplant! !